I was craving granola bars but didn’t want to step foot near my oven because it’s so hot here in Texas, sooooo these no-bake granola bars happened! 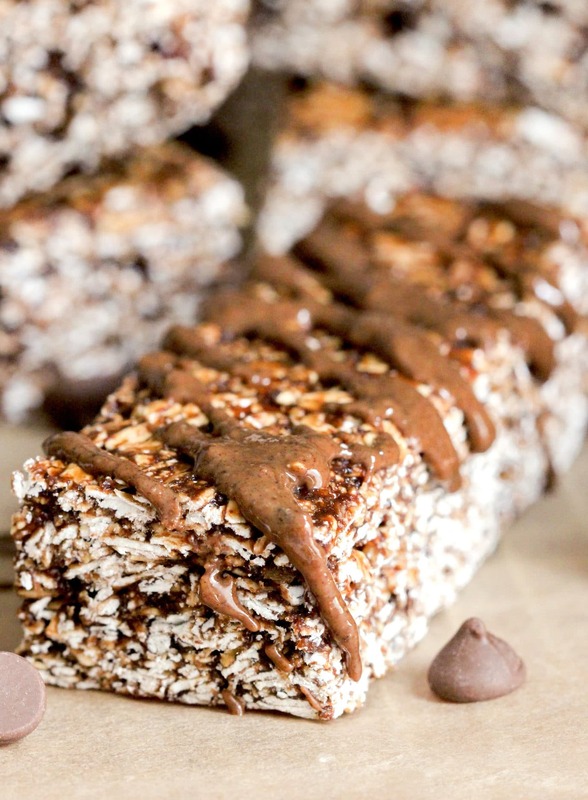 These Healthy No-Bake Nutella Granola Bars are sweet, soft, and chewy, and full of chocolatey-hazelnut flavor, you’d never know they’re gluten free, high protein, and high fiber with no sugar added! Homemade granola bars are usually baked and end up hard, dry, and crumbly. There’s a time and a place for crumbly foods, but when you’re hungry and on the go, trying to munch on a crispy, messy bar while driving to work isn’t really ideal. If you’d rather snack on chewy Clif bars rather than those break-into-a-million-pieces Nature Valley bars, then these homemade granola bars are right up your alley. And they’re SO incredibly easy to make too! All you gotta do is mix the ingredients in a bowl, press into a pan, refrigerate, and slice. That’s it. I expected these granola bars to be mildly sweet, seeing as how they don’t have any sugar added, but at first bite, I was surprised at the decadent sweetness. I could taste the chocolate (of course) and most definitely the hazelnut. One bite, two bites, three bites, INHALE. I made these with Naturally More® — a nut butter company taking their butters to the next level. They make Organic Peanut Butter, Protein-Packed Peanut Butter, and Probiotic-Infused Almond Butter and Chocolate-Hazelnut Butter. All of their products are non-GMO, gluten-free, dairy-free, and vegan (whoop whoop!). The spread I used in this recipe has 80% less sugar and 65% more protein than Nutella! 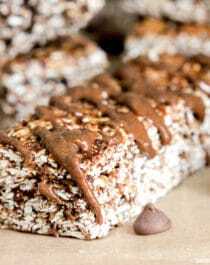 These No-Bake Nutella Granola Bars are sweet, soft, and chewy, and full of chocolatey-hazelnut flavor, you'd never know they're gluten free, high protein, and high fiber with no sugar added! In a stand mixer with with beater attachment, add the applesauce, chocolate-hazelnut spread and stevia extract. Mix on low speed. A yummy, chewy granola bar recipe that’s also filled with a whopping 19g of protein and 7.5g of fiber?!? YASSSSS! If you’re looking for even more decadence, simply add ⅓ cup of mini dark chocolate chips to the recipe! 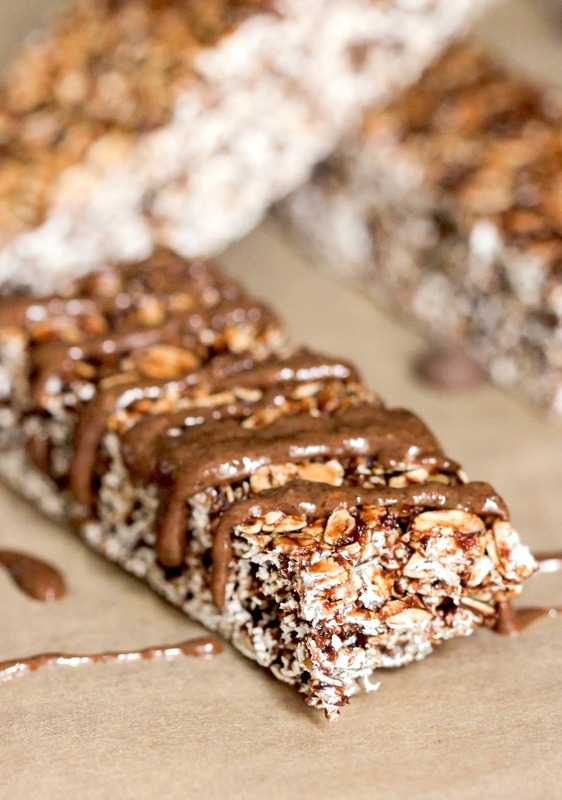 These soft, chewy, sweet and delicious (secretly healthy) No-Bake Nutella Granola Bars make for the perfect breakfast, especially with some coffee on the side. This post was sponsored Naturally More®. All opinions are mine and mine alone! Thank you for supporting the sponsors that keep this blog going! I think you could double the cocoa powder to 60g (3/4 cup) but be sure to increase the erythritol too (I would double that too) because the protein powder comes pre-sweetened. I wouldn’t add flour because raw flour has a strange taste. Weirdly enough, it’s been 80 degrees the past 2 days over here in Pennsylvania, but last week it was in the 50s! The LAST thing I wanna do today is turn on my oven so these granola bars are PERFECT!! And Nutella. YASSSSS! 1) Pumpkin puree for apple sauce? 2) Almond butter for nutella spread? 3) Whey isolate for whey concentrate (the link you provided is a whey concentrate)? Thanks so much for all the hard work you put in your blog. You’re awesome! Thank you so much!! I haven’t tried those substitutions but I would imagine they would work just fine. 1) Since pumpkin is a tad bit thicker than applesauce, I would recommend adding ~1 Tbs extra to the recipe. 2) Since almond butter isn’t flavored, you may need to add a few more drops of stevia. Since you’re using pumpkin, maybe try adding some cinnamon, nutmeg, ginger, and cloves (or pumpkin pie spice)! Can I use your Nutella recipe for this instead of the hazelnut butter you are recommending? 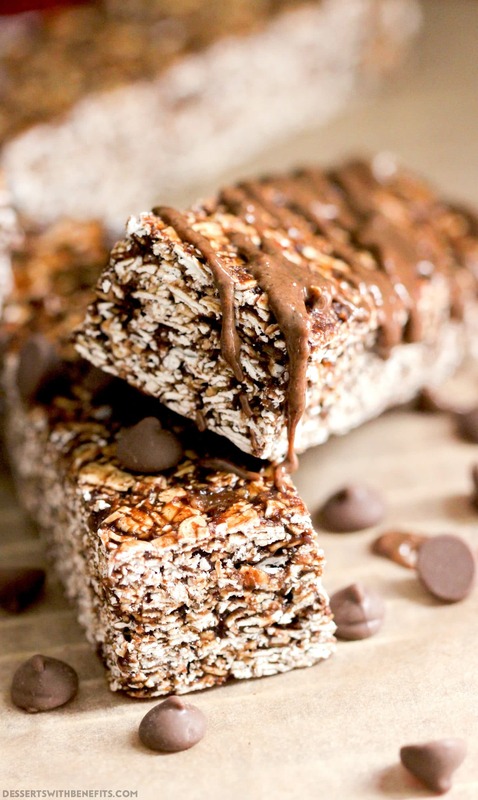 Pingback: 15 Healthy Nutella Recipes to Satisfy Your Sweet Tooth, Guilt Free! Oh, I forgot one more question. I don’t like protein powder, could I sub it with something else like oat flour? You can for sure use regular Nutella or peanut butter instead of the kind I used. You should decrease the amount of stevia to about ½ tsp. As for the rice krispies and pretzels and oats, I don’t know because I haven’t tried it. But feel free to test it out! Also, you can’t substitute the protein powder. It’s a major ingredient. With all the subs you want to make it’s a completely different recipe. Have fun in the kitchen and hopefully whatever you make turns out!